By combining telescope observations with advanced modeling, astronomers have found a rare triple quasar, called QQQ J1519+062. For only the second time in history, a team of scientists including Michele Fumagalli from the Carnegie Institution for Science in the United States have discovered an extremely rare triple quasar system. Their work is published in the Oxford University Press journal Monthly Notices of the Royal Astronomical Society. The team led by Emanuele Farina of the University of Insubria in Como, Italy, combined observations from the New Technology Telescope of the European Southern Observatory at La Silla, Chile and from the Calar Alto Observatory in Spain with advanced modelling. This enabled them to find the triplet quasar, called QQQ J1519+0627. The light from the three quasars has traveled 9 billion light years to reach us, which means the light was emitted when the universe was only a third of its current age. Two members of the triplet are closer to each other than the third. This means that the system could have been formed by interaction between the two adjacent quasars, but was probably not triggered by interaction with the more-distant third quasar. Furthermore, no evidence was seen of any ultra-luminous infrared galaxies (galaxies with very strong emission in infrared light), which is where quasars are commonly found. As a result, the team proposes that this triplet quasar system is part of some larger structure that is still undergoing formation. “Honing our observational and modelling skills and finding this rare phenomenon will help us understand how cosmic structures assemble in our universe and the basic processes by which massive galaxies form,” Fumagalli said. 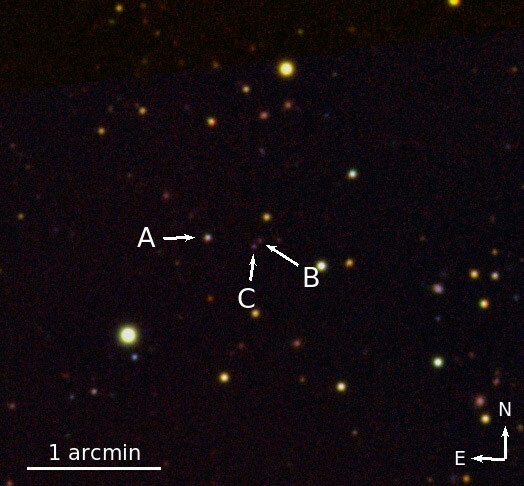 Be the first to comment on "Astronomers Discover a Rare Triple Quasar"